From April to September the rains come to the south coast, so if you want to visit Sri Lanka during these months, after exploring the Cultural Triangle head to the superb beaches of Pasikuda on the northeast coast, arguably the best on the island. See all the key sights including Kandy, Sigiriya, Dambulla & Polonnaruwa. English speaking guide, all transfers & specified sightseeing included. Today we visit the sacred Temple of the Tooth that houses a tooth relic of the Buddha. Religious pooja ceremonies, when the golden casket containing the tooth is revealed, are held daily at 05.00, 09.30 and 18.30 - so this is the best time to visit. Kandy was the last capital of the Sri Lankan kings and is a World Heritage site partly due to this temple. Its principal Buddhist complexes have considerable importance. The high priests of the two best known, Malwatte and Asgiriya, are the most important in Sri Lanka and the Asgiriya Maha Vihara has a large reclining Buddha image. 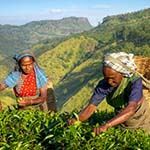 Around lunchtime enjoy a Sri Lanka Cooking Class, learning to make traditional spicy foods which you can all enjoy. The balance of your afternoon is free to explore more of Kandy on foot and in the evening enjoy a Cultural Show, with dancing and fire walking. Note: Please dress appropriately when visiting sacred sites, with shoulders and knees covered. Here you can explore these magnificent ruins, which contains some fine examples of Buddah statues and marvel at this ancient civilisation. We then continue 2-hours to the seaside town of Pasikuda on the warm east coast, with its magnificent Indian Ocean beaches. Check in and relax on one of the most beautiful beaches in the world. Note: Please dress appropriately when visiting sacred sites, with shoulders and knees covered. As your Cinnamon Air return flight has an 18 kg baggage limit, your driver will take any excess luggage from you when he drops you off at your hotel and return these to you in Colombo. At leisure to relax and enjoy the white sandy beaches of Pasikuda. With one of the longest stretches of shallow coastline in the world, you can walk miles and miles in these crystal clear sea waters. There are also watersports available, including wakeboarding. Note: Excursions to Pigeon Island should be pre-booked, as local operators are not allowed to collect guests from hotel beaches. Transfer to Batticaloa Airport for your light aircraft flight to Nayakakanda airport, north of Colombo.